He was 2016’s MLS Goalkeeper of the Year last season, and he’s the guest this week on the latest edition of the KYW Philly Soccer Show. 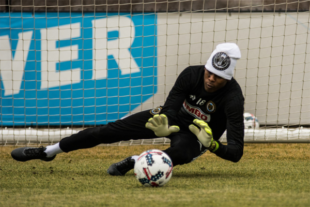 Philadelphia Union netminder Andre Blake talks with KYW’s Greg Orlandini and PSP’s Mike Servedio as he and his teammates kick off the preseason. Blake says the disappointment of the team’s early playoff exit against Toronto FC last season is giving the players the inspiration to work harder as this season gets started. He also talks about representing Jamaica this summer during the Gold Cup. After that, Greg and Mike also talk about some of the new faces in camp for the Union this season, including former US National Team defender Oguchi Onyewu. To listen to the pod, click on the player above or visit the Philly Soccer Show iTunes page. Follow the pod on Twitter at @KYWPhillySoccer.